AWS Amplify makes it easy to create, configure, and implement scalable mobile and web apps powered by AWS. Amplify seamlessly provisions and manages your mobile backend and provides a simple framework to easily integrate your backend with your iOS, Android, Web, and React Native frontends. Amplify also automates the application release process of both your frontend and backend allowing you to deliver features faster. Mobile applications require cloud services for actions that can’t be done directly on the device, such as offline data synchronization, storage, or data sharing across multiple users. You often have to configure, set up, and manage multiple services to power the backend. You also have to integrate each of those services into your application by writing multiple lines of code. However, as the number of application features grow, your code and release process becomes more complex and managing the backend requires more time. Amplify provisions and manages backends for your mobile applications. You just select the capabilities you need such as authentication, analytics, or offline data sync and Amplify will automatically provision and manage the AWS service that powers each of the capabilities. You can then integrate those capabilities into your application through the Amplify libraries and UI components. AWS Amplify is the fastest and easiest way to build mobile applications on AWS. 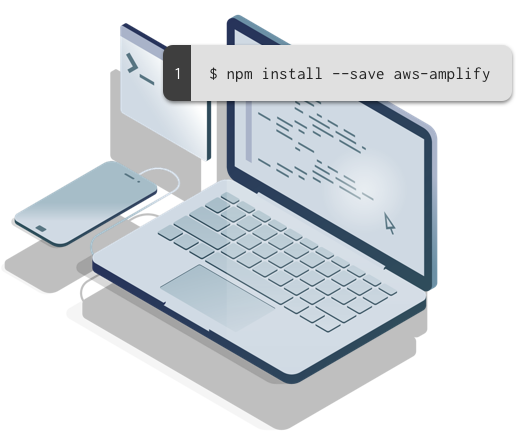 Amplify allows you quickly set up authentication, analytics, and offline data sync for your mobile applications with a few commands and integrate them into your application with a few lines of code. AWS Amplify allows you to easily build engaging and interactive experiences for your customers. You can create voice and text interfaces powered by Amazon Lex, add virtual reality scenes created with Amazon Sumerian, or target your users with push notifications with just a few lines of code.  The Amplify Framework provides a set of libraries, UI components, and a command line interface to build a mobile backend and integrate with your iOS, Android, Web, and React Native apps. The Amplify CLI allows you to configure all the services needed to power your backend through a simple command line interface. The Amplify library makes it easy to integrate your code with your backend using declarative interfaces and simple UI components. Amplify leverages a core set of AWS services organized into categories—including offline data, authentication, analytics, push notifications, bots, and AR/VR. Query, store, and sync application data in real-time with features such as online and offline data access, data manipulation across multiple data sources, and GraphQL support. Add user sign-up, sign-in, and access control to mobile and web applications. Integrate tailored push notifications with analytics and targeting built-in. Create conversational interfaces using voice and text powered by deep learning. Manage user content securely in the cloud or on the device. Make HTTP requests using REST and GraphQL easily and securely. Integrate virtual reality (VR), augmented reality (AR), and 3D scenes easily. AWS Amplify fully automates mobile application tests. You can also streamline the deployments for your web app and backend resources using the Amplify Console. This allows you to quickly and easily test each code change and catch bugs while they are small and simple to fix. With Amplify, you can quickly iterate on feedback and get new features to your users faster. The AWS Amplify Console is a continuous delivery and hosting service for mobile web applications. Modern mobile web applications are constructed as single page web applications which package all application components into static files. The AWS Amplify Console makes it easier for you to rapidly release new features, helps you avoid downtime during application deployment, and handles the complexity of simultaneously updating the frontend and backend of your applications. AWS Device Farm is a full managed testing service for your iOS and Android applications. You can perform automated tests against a large collection of physical devices in the AWS Cloud. Or, you can perform manual tests by interacting with devices in real time, directly from your web browser.